Warm, delightfully fluffy on the inside and lightly crunchy on the out. Sounding good already? As a testament of how wonderful they truly are I’m going to confess to a little kitchen mis-hap: I burnt the first one. And eventhough it was pretty black on the outside, I just couldn’t resist but to eat the rest. You don’t often come across food that tastes good eventhough you’ve burnt the living daylights out of the first batch, do you? Imagine how good they are cooked to perfection. I don’t make pancakes as often as I should, or at least, I’d like to. Mr Chipconnoisseur doesn’t eat them much, but I’ll definitely make these again and who knows, he might just want to jump on the breakfast pancake wagon. The recipe? Borrowed from the $2 Gary Mehigan’s Comfort Food, a second in the mini series sold by newsagents across town as part of the Daily Telegraph’s / Sunday Telegraph’s Food Month . If you’ve missed out on the books (today is the last day), you may still be lucky to pick up a few random ones – one of the city stores had Gary’s mini book as late as this week. Ask around. They are worth it and Gary’s is one of my favourites – it truly is full of warm and cosy comfort food ideas. Perfect for Winter. Oh and when it comes to bananas, which are quite pricey in Australia at the moment, I buy mine from the “seconds” corner for a little over $3 a kilo, peel them and freeze in zip lock bags. They are great for smoothies and making instant banana mousse. The recipe comes from Gary Mehigan’s Comfort Food cookbook. I have adapted it by making the date and banana butter without the butter. Pancakes: sift the flour into a bowl. Add salt and sugar. Mix milk and egg in a measuring jug and add to the flour, whisking until there are no lumps. Melt butter in a small pan until it bubbles and becomes lightly brown. Add melted hot butter to the batter and whisk to combine, then add ricotta and mix to combine – some lumps may remain, but that’s perfectly ok.
Heat a little oil in a heavy-based pan over medium heat. Add a ladleful of batter to the pan and cook for 3 minutes or until air bubbles become visible on the top. Flip the pancake and cook on the other side for a further 3-4 minutes or until nice and golden brown. Repeat with the remaining batter. Date and banana butter: using a stick blender, whizz bananas and dates until light and creamy. 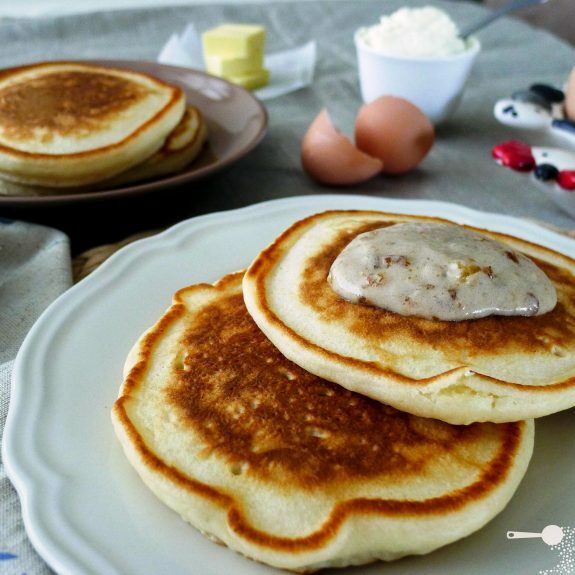 Serving: serve pancakes warm with a good spoonful of the banana and date topping. Note: pancakes will keep in the fridge for a couple of days – just cover them with cling film. Reheat in a lightly oiled pan or in the microwave for about 30 seconds. oh marty, if Mr C wont share in your pancake obsession, I’ll gladly eat his share. Yum! Love the idea of the date-banana “butter”. It’s such a good idea isn’t it? Perfect as a dessert on it’s own or afternoon tea with the pancakes! the date banana butter sounds freaking awesome! looks gr8 i cant decide whehter to make these, or the grilled porto bello with egg breakkie this sunday..!! Oooh tough choice! If I was making my decision today I’d say pancakes, but I always feel like mushrooms! Sorry, I’m incapable of helping! Date and Banana – what more could you want and then you throw ricotta in the mix. Three of my favourite ingredients. Beautiful! I made the same pancakes from the same booklet, but without the butter. They are good, aren’t they? So light. Yours look fabulous; love the setting. My thank you. And yes, the pancakes caught my eye straight away with the word: fluffy in the name. So good. Yum! My boyfriend is the pancake chef, I’ll have to see if he’s adventurous enough to test this one out. Otherwise I’ll definitely be giving it a try! I’m intrigued by the date and banana butter. It sounds like a wonderful topping for pancakes! This is the second time I’ve seen this recipe today. They look incredible and the date and banana “butter” sounds delish! Oh yes! Canadian maple syrup, sooo good. And natural. Great to use here if you like a little more sweetness. I just made ricotta pancakes too, they are so good! These look delicious! We made these over the weekend for a brunch, sooooo good! And the batter kept until the next day for leftovers too. Oh wow! Good to know! I simply cooked all pancakes straight away. Love the sound of the date/banana butter and I’m not even big on bananas! Ricotta pancakes always sound so good and I still haven’t made them. Thanks Greg, there are always things I’d like to try making but don’t… Having a recipe blog helps with the encouragement! Revolutionary – the date banana butter without the butter! I love it 🙂 Ooooh fluffy pancake goodness. YUM. I love the use of ricotta in pancakes – it’s surprisingly light and full of protein – an ideal breakfast option. The date banana butter looks gorgeous – have to try that one for sure! Thanks. Reading your post I realised I haven’t made pancakes for ages. Think it is about time I do. Date and banana butter, oh wow, totally yummy. I have just seen your recipe above – funny I made banana pancakes yesterday – I would not have thought to use up some left over ricotta in my recipe. Will try it next time. Usually put yoghurt in the mixture for added taste and creaminess. I’m with you – never thought of putting ricotta into the pancakes until I came across Gary’s recipe. But it works! Yoghurt is a good and new idea too – I’ve never used it myself.